This post is part of a new series looking the business opportunities offered by China going global. The graffiti “Ding Jinghao was here” made international headlines around the world last year. A normal piece of graffiti, but this particular teenager’s bon mot was made on an ancient wall in the ruins of Luxor and highlighted what many felt was the unworldly nature and bad manners of Chinese tourists travelling abroad. A combination of rising incomes, the introduction of a more relaxed visa regime by both the Beijing government and foreign governments, along with a curious population unable to travel freely for so long has seen the start of large scale travel abroad by Chinese tourists. The TUI Group travel agency estimate that Chinese tourist arrivals to Europe will quadruple from 3.8 million in 2010 to 15 million in 2020. Currently the market is dominated by mass tour groups, 30 plus people on a bus, stopping for photo opportunities and large scale shopping expeditions. This model may well change with more travellers wanting more individualistic adventures and others seeking out various niche holidays. Whatever model predominates, this equates to a massive number of new tourists on the world market. While the traditional powerhouses of Europe, USA & Japan are static in terms of tourist numbers, China has a growing middle class and wealthy elite which is predicted to continue expanding for decades to come. Currently the typical Chinese tourist favours historical monuments over sandy beaches, most travellers will be originating from overcrowded, polluted cities and towns, so clean air and unspoilt countryside will be looked upon with favour. Tours of palaces, castles and museums are going to be an easier sell than bungee jumping, kayaking or camping in the jungle. There is an untapped market for a new wave of Chinese tours that could lead to more trips to lesser known historical cities and monuments. Chinese tourists will start to seek out more unique and unknown experiences and will want to see beyond the Pyramids, Eiffel Tower and Grand Canyons of the world. The Scottish Highlands, Spanish cities such as Seville, Granada and Jerez and countries like Sri Lanka are the kind of places which are potentially well placed to attract tourists that are looking for new experiences. You can’t always predict the future, but….. Currently Chinese tourists are known for their extravagant shopping trips to Parisian boutiques and Milanese shoe shops, while these sprees will no doubt continue; the trend will be towards the experience holiday end of the market. So start thinking about how Chinese tourists might enjoy gastronomy tours, safaris in Latin America and Africa, or watching Serie A football matches in Italy or basketball games in the USA. The key (as with many tourists) is taking something people are reasonably familiar with at home and presenting them with the real authentic deal to enjoy in person. Tried and loved Italian food in Shenzhen, now try the real thing in Tuscany for a week. Watched the NBA at home on TV? Now enjoy a live game from luxury box with a selection of Chinese and US beers and snacks. Many airlines lack direct flights to mainland China. This means that huge cities such as Hangzhou, Xiamen, Shenzhen and countless others are difficult to reach. 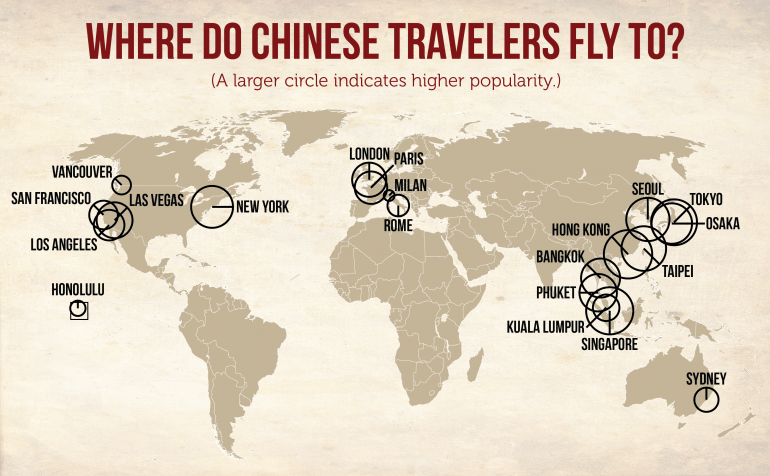 Chinese travellers from these cities may need to change twice before reaching their destination. Changing once on a flight is bad enough, but twice is completely off-putting. The opportunity to open up more flights between medium sized cities is huge, the airlines that connect the likes of Shenzhen with Lagos; Urumqi with Cairo and Hangzhou with Sao Paulo could prove to the be the winners in international air travel. If the social media strategy promoting your hotel, tour or city is based around Facebook or Twitter think about getting on Renren and Weibo the Chinese equivalents to these two net giants, otherwise you are unlikely to attract anyone in Mainland China (Facebook remains the wrong side of the great firewall). I spoke to the marketing manager of the Shangri-La hotel in London who explained how they had set up shop in London’s iconic Shard building, a huge structure south of the River Thames near to London Bridge. Giving fantastic views of some of London’s historic sites such as the Tower of London, Tower Bridge and St Pauls Cathedral the hotel offers Chinese tailored luxury with views of historical London. The hotel was developed specifically with Chinese tourists in mind and following the classical principles of Feng Shui, a Chinese philosophy of design, which seeks to harmonise humans with their surroundings. Ease is everything, while many young western travellers revel in tough (authentic conditions) and boast of cockroach filled hotels and 24 hour bus journeys across pock marked roads surrounded by bandits, this approach has not yet caught on with Chinese tourists, who prefer luxury and comfort (this seems obvious – but it pays to emphasise and promote the luxurious elements of a hotel). Think familiar Chinese brands and food, such as instant noodles in the hotel room, as well as signs and information in Chinese characters. These little touches can lead to personal recommendations and further bookings. Keep an eye out for legislative and political changes, the British government realised it was getting a fraction of the influx of Chinese tourists Paris was thanks to an onerous visa regime (tourists have to fill in a single form for the Schengen Visa – allowing entry into all of Western/Central Europe.) On the other hand to get into the UK involves filling in a tedious 30 page form, and let’s face it no one like filling in forms. Such red tape means the UK has lost out on thousands of tourists and millions perhaps billions of pounds, despite the country being a highly favoured destination for Chinese tourists. The government are now changing this to allow easier access into the UK. While many places have seen a dramatic rise in Chinese tourists – over familiarity or changing tastes could see them go elsewhere, leading to a dramatic drop off in business. Governments that are perceived to be unfriendly towards Beijing could see a drop off in tourist numbers as they are “punished” as the government makes it harder for people to go there. Chinese tourists are seen as a soft touch by criminals and are often targeted by robbers and pickpockets (especially in popular upscale shopping districts), extra care should be taken to protect and warn tourists especially as if they are new to international travel. In addition their relative naivety and lack of experience abroad could lead them open to scams, although the fact they travel in tour groups offers some security. As Chinese travellers and the younger post 1980 generation or “Bailinghou” become more adventurous, and in particular those with better foreign language skills the scene could well move towards more individual holidays and adventure and a decline in group bookings. *Montargis is a French town where future Chinese leaders such as Zhou Enlai and Deng Xiaoping studied. Trier is the German birthplace of Karl Marx, still a major icon, even if China has moved away from his school of thought. The Willow Tree at King’s College Cambridge is the subject of Chinese New Moon poet Xu Zhimo’s poem On Leaving Cambridge – a big hit in China by all accounts. Thanks, glad it was useful .